The ubiquity of complex numbers throughout fundamental physics has never been satisfactorily explained. 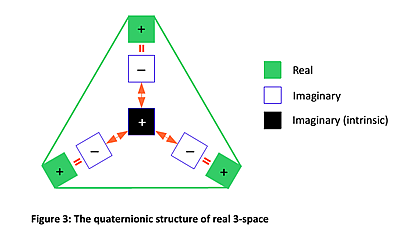 Moreover, the mathematical primacy of complex and imaginary numbers suggests the primacy of complex and imaginary structures in Nature, while further implying the existence of imaginary spatial dimensions preceding real dimensions. On this basis a consistent cosmological framework is erected, guided by a direct reading of the empirical and theoretical evidence, embracing essential principles of quantum theory, relativity theory, and string/M-theory.